Whether you’re training for your first half-marathon or your hundredth, the shoe you choose to get you through the miles of preparation required is crucial. From tempos to intervals on the track to long runs, each day of training can be maximized with a different shoe. You wouldn’t wear the same pair of shoes to go the grocery store as you would to go to a wedding, right? The same goes for workouts–there are different shoes designed for different paces and distances. 361 Degrees has a line up of shoes aimed to get you through every part of your training plan. The 361-Strata 3, 361-Meraki 2 and 361-Spire 3 are all designed with a specific workout in mind and together they make the trifecta of running footwear. The 361-Strata 3 is a structured cushioned trainer. With medial support the shoe falls into the stability category, the 361-Strata 3 is great for logging a lot of miles or when you’re a little fatigued. 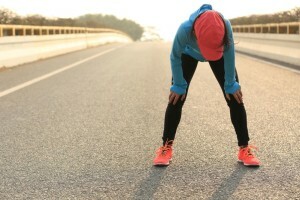 Even if you’re not an overpronator, using a shoe with a bit of medial support can be beneficial if you’re especially tired, and believe us, there will certainly be days during your half-marathon build where you feel especially tired. For those days, which hopefully coincide with your recovery days, throw on a pair of Strata 3’s and get your long, slow mileage done while taking some of the strain off of your body. The 361-Meraki 2 is a neutral cushion shoe that is also responsive, making it ideal for tempos or intervals. The Meraki 2 QU!K Foam midsole is 361 Degrees’ own blend of EVA and rubber that is designed to provide a combination of cushioning and responsiveness. The outsole of the shoe has a blown rubber forefoot and carbon rubber heel. The 361-Spire 3 is a runner’s ideal mid-distance shoe. With solid cushion combined with a snappy ride, this shoe is designed to get you through a longer but fast-paced run. The QU!K Spine carbon fibre plate allows the runner to transition efficiently from contact to take off and provides an extra spring in your step to get you to 10K in no time. This is a beginner half-marathon training plan. On workout days, remember to include a 10 to 15 minute warm up and cool down, this is important to get you ready for the workout and also adds a little extra mileage to your week. Find your 12 week plan here: 361 half-marathon plan.